If you think that bullying, also known as workplace harassment, doesn’t exist in your business, you are fooling yourself. Businesses of all sizes experience varying scenarios of workplace harassment. How can you recognize it and what do you do when it happens on your watch? 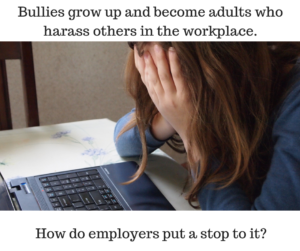 Bullying in the workplace often takes place under the radar. Most professionals don’t openly harass their co-workers in front of others. Harassment takes many forms, most of which are not loud, noticeable, or reported by the co-workers of the person being harassed. This article is not addressing sexual harassment, known to many as the “quid pro quo” scenario described under the law of the Department of Labor. Although sexual harassment is workplace harassment, this article is addressing the other type known as Hostile Work Environment. Harassment can be caused by an employee’s supervisor, a co-worker, or even a customer or vendor. We would all like to think that people could just be professional at work and not have to deal with harassing behavior, but that just is not a reality. Discriminatory harassment is one of the most common types. Unfortunately, it can be hard to prove and frequently goes unreported. The harassment might be obvious but the motive might be unclear. For example, an employee could be getting picked on behind the scenes and the motive might be anything ranging from racial harassment to gender or religious harassment. Slurs, insults, jokes, or degrading comments are just a few ways someone can be on the receiving end of harassment. Denial of promotion, non-inclusion in collaboration, or lack of communication about workplace matters are indirect, and just as wrong. If you suspect there is harassment going on in your business, it is best to take a proactive approach as quickly as possible. Start by making sure your policies are clear and up to date. Hold a staff meeting to review your policies and explain your zero-tolerance for infractions. Your disciplinary policies should clearly state ramifications for harassment. Make a follow up appointment within three days with the employee to let them know the status of the complaint, even if hasn’t progressed due to the time required to investigate. Contact your attorney for the purposes of understanding when harassment has become unlawful and follow his or her advice on how to proceed. Harassment is considered misconduct under the law and is treated very seriously. Your employees are the most valuable asset to your company. Preventing harassment before it happens is optimal. One clue that harassment might be taking place is a sense of exclusion. Be available by meeting with people informally on a regular basis. Get out of your office. Management by Walking Around (MBWA) is a helpful way to see behavior and hear murmurings that may indicate harassment. Include everyone in all activities. Go to lunch with various people, individually, or by department, and include everyone. Sometimes just asking someone to lunch makes a big difference in how they perceive their work environment. Discuss any concerns you may have from your observations with your supervisors after they have been fully trained. They should be your eyes and ears when you are not available. To read more to understand why people bully, click here. In all cases, bullying should not be tolerated and must be deal with quickly and consistently. Employees are valuable and want to be respected for their contribution. When an employee is feeling harassed, he or she will not perform well and will begin to consider looking for employment elsewhere. Understanding where is starts and how to deal with it can demonstrate to your entire crew that you really do care about providing a respectful workplace for them.